How Weightlifting Can Benefit Your Yoga Practice? In the past, people had more active lives, worked on the fields and trained strength daily through their manual work. That was also the life of yogis, and for them, the practice of Yoga was enough. Today our lives are, more or less, sedentary, we don’t have natural daily challenges, so we have to make them for ourselves. People need both, relaxation and explosive strength to stay healthy and strong, and to continue their growth mentally and physically. Some people are naturally flexible, and if their strength doesn’t support this, they could easily injure themselves in a yoga class. Weightlifting builds up strength and makes poses more effective and less dangerous. When you start practicing yoga, almost everything you do builds up your strength, but with time everything becomes easy for your body to perform and it stops progressing, the muscles don’t get stronger, you are mostly just maintaining what you already achieved. In weightlifting, progressive overload, or lifting heavier with time, allows you to keep going forward. In a yoga class you don’t have to focus on that, but solely on the practice and you could also see that the poses become more intense for you. It is of great importance to balance strength and flexibility, and although yoga combines both, it usually focuses more on flexibility, so doing some weightlifting could be the balancing stick that holds your practice together. When you are strong and flexible at the same time, it is easier to be aware of your muscles while working out. This kind of balance in the body also allows faster and greater progression. It might be hard to keep doing yoga daily if your life is stressful and intense. Too many people give up yoga because they don’t feel like it takes out all of their energy, but it might just mean it is not enough. They need to get rid of all the concentrated stress to be able to calm completely and become present enough for yoga. Regarding your practice schedule, you can choose to practice yoga and go to the gym on nonconsecutive days which will give you enough time for rest. If you want to keep doing yoga every day, do a class in the morning and then go to the gym in the evening. You could also do yoga after the gym, but then you should do a restorative practice, maybe Hatha or Yin, to balance out the energies and to stretch the muscles you just worked on. Choose exercises which focus on more muscles at the same time, such as deadlift, squats or bench, because overdeveloping of only one muscle in the group could throw your body out of balance. In the end, if you believe that going to the gym is unconnectable with the spirituality of yoga, try to come there with the same mind and awareness of breath as in yoga. Try to meditate as much as you can while you do it, and you will find that it is not all that different after all. When you think of brunch, you probably imagine a relatively chic affair with delicate finger foods alongside hearty meats. This is a wonderful social gathering filled with all of your favorite foods, but you may struggle to decide how to dress for the occasion. Brunch is still in the early morning, so you may want to be equal parts comfortable and cute. Fortunately, there’s a solution to the brunch outfit dilemma. A quality pair of black yoga leggings can pay huge dividends when it comes to your overall style. When you’re heading to brunch, grab your pair of black yoga leggings to start putting together the perfect outfit using these style tips. Delicate floral patterns are a great match for a casual brunch on Sunday morning. They always look elegant and dainty, a sure way to elevate your outfit for a fancier event. You may look for silk tops that flow with tiny forget-me-nots dotting the fabric. Some individuals may prefer the bolder look of bigger flowers on a cotton tunic. There are plenty of options for using floral prints to dress up with your yoga leggings. A cardigan is always a classy piece of clothing. It makes sense to wear this super comfortable and casual piece to a brunch. However, you can stand out from the traditional garb with a cardigan that reaches down to your knees. Duster cardigans in luxuriously soft fabrics and delicate shades can make your outfit feel more polished. Pair them with dainty camisoles underneath for a well-balanced look. If you know that you need to dress up for a particular brunch, a pair of strappy wedges can fit the bill. They give you a little more height, which can make legs appear long and lean. Any type of shoe with a heel is a dressier alternative to flats or flip-flops. Canvas straps with natural cork bases are a classic option that ensures your shoes will stand out. A pair of heeled booties are also a great option for the fall and winter seasons. Solid black yoga leggings are typically the standard for a brunch occasion. However, that doesn’t mean that your entire outfit has to be humdrum and boring. You may want to consider adding some fun pattern to other areas of your outfit such as your shoes or top. Boat stripes in classic shades of navy blue and white can be a classy option. You may even want to experiment with adding a little metallic shine to your top with rhinestones or sequins. Brunch can be an extremely classy affair that you look forward to all week. You may crave the syrupy goodness of French toast or the mouth-watering mountains of bacon. No matter what you look forward to, you can head to brunch in style and comfort with these four hot ways to wear yoga leggings. We are smack dab in the middle of winter and, although it was around 50 degrees out yesterday, cooler weather is here today and here to stay for a while. Winter brings to mind warm spiced drinks, sparkly snow, chili, and layers. Lots and lots of layers! Winter is a great time to stock up on layers to keep you comfortable, no matter the weather, and yoga clothes are a great choice for layers both outside and inside the yoga studio. When you are thinking about putting together your next outfit, start with a solid color, ankle-length yoga pant that allows for movement for walking to or from work or for Adho Mukha Shavasana (downward-facing dog pose) at your next yoga practice. If you want to go beyond a solid color, look for a yoga pant that has a geometrical design with a contrasting color. If black yoga pants are your go-to color, spice up your wardrobe a little bit by choosing black yoga pants with gold dotted geometric designs. Now that you’ve got the lower half of your outfit figured out, it’s time to plan the top half. A yoga bra should be comfortable and breathable, yet still provide shape and support. For this layer of your outfit, choose a cool design that will function as well as be fun. Try a crop top bra in a bold color with mesh overlaying a sweetheart shape top. A crop top with soft, formed cups and a wide bottom band will keep you covered and still looking fashionable. Choose one that has straps as well, for a little extra design and to keep everything in place during your next Surya Namaskar (sun salutation yoga sequence). A tank top is a great next layer. It’s a versatile layer that can keep you cool and collected while holding Vrikshasana (tree pose) and warm you up under other layers. Mesh cutouts are a hot “athleisure” wear trend so pick a tank top that has mesh cutouts in the back and sides. This combination of fashion and design is breathable and airy. To emphasize the layered look, don’t go too short with this layer. A longer, hip-length tank top will keep you covered in any type of situation or pose you find yourself in. Pick your loose-fitting, hip-length tank top in a great accent color such as a coral or peach so it will peak out beneath your top layer and go with your black yoga pants. This will provide nice movement in your overall outfit. A long-sleeve, lightweight sweater is the perfect top for your layered outfit. A sweater made out of natural fabrics will keep you cozy while still being soft against your skin. Keep it a little on the short side, with a high crew neck for a flattering look with your other layers. A light color will help your winter look stay fresh all season long. Pick a comfortable sneaker that is more stylish than a running shoe but not quite a dress shoe. This will allow you to easily go from the office to the yoga studio and back without having to haul around two different pairs of shoes. 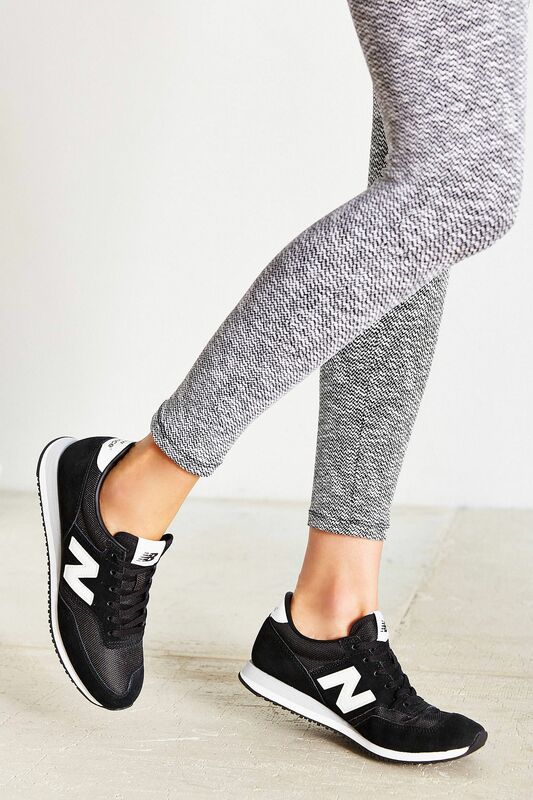 If you went with the black yoga pants, a charcoal and black two-toned shoe is a nice choice. Finish off your look with a yoga mat on a strap or a black tote bag that can get you from your early morning yoga practice to your night out with friends. With this combination of layers, you’ll be winter-stylish, cozy, comfortable and ready for anything that comes up in your day.